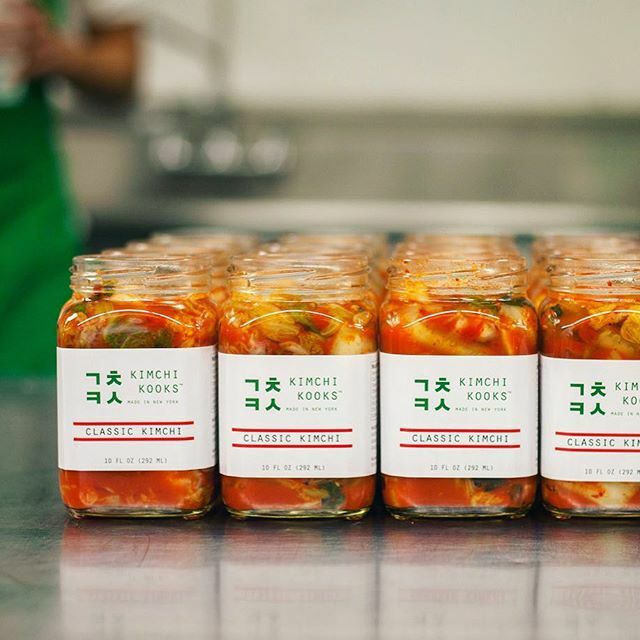 Kimchi Kooks makes small batch kimchi in Brooklyn using seasonal, raw, local vegetables. Raw and gluten-free, this kimchi is packed with essential vitamins and non-dairy probiotics. Kimchi Kooks also makes ready-to-eat Korean street food at the farmers' market, like Pajeon, a scallion pancake served hot off the griddle with a heaping serving of kimchi on top. In 2015, Kate Kook and her son, WooJae Chung, established Kimchi Kooks in Brooklyn, New York. But fermentation of foods and beverages had long been a way of life in the Kook family. The technique and the knowledge of various types of ingredients and the resulting quality of foods have been taught and handed down from generations of men and women in the family. The recipes come from Kate Kook, whose grandfather, when she was growing up in Seoul, owned the then well-known K?mbong Brewery that produced cheongju, a high quality rice wine, from early 1920s until the late 1960s. Inspired by her experience of living in New York City, Kate created a range of kimchi recipes using local, seasonal ingredients. Out of these experiments comes the Kimchi'd� line, a contemporary take on a timeless tradition. Kate has since perfected her own take on the traditional Kook recipes, including Classic Kimchi and the Original White Kimchi.